Exclusive They've really gone and done it. 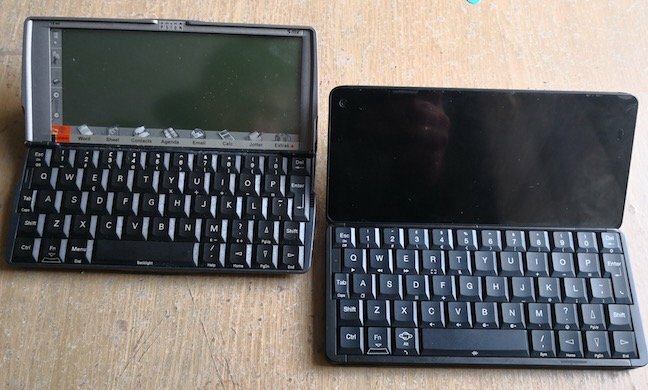 They've made a modern Psion: a brand new computer that fits in your pocket – one you can touch-type on and everything. Planet Computing's Gemini is not just a PDA: it has been called "the only interesting phone in the market," which shouldn't sound so weird – the Gemini model with a SIM card slot is a phone in every respect. 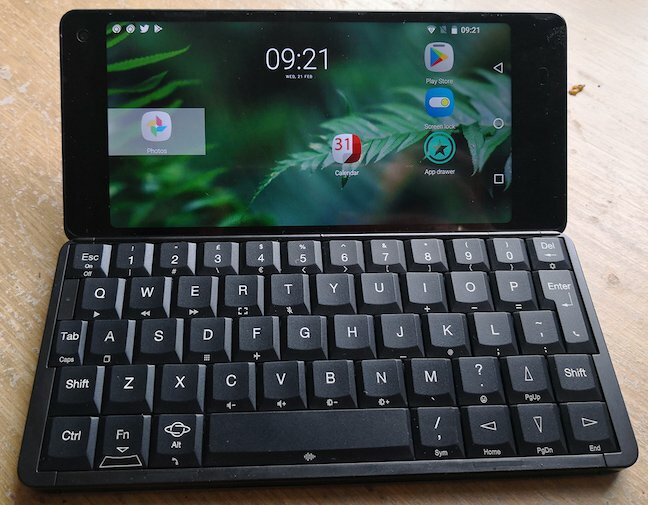 It's just a phone that comes in a clamshell case with a physical keyboard, rather than a generic black rectangular slab. I've been using a production Gemini for a few days, the same one thousands of early Indiegogo backers will receive in the coming week. And I've a few first impressions to share. To get a new computer to market in a year, with an entirely new mechanical hinge and keyboard, is an amazing achievement by UK-based Planet and design partners Therefore. Planet is a company of three core people with a handful of helpers. And it's not like they could copy something as there isn't anything remotely similar in production today. It runs a skinny Android operating system, and apps advertised in the "Planet App Bar" need to be downloaded manually. The purpose-built Calendar wasn't included and the open-source K9 email client in the Play store doesn't support Gemini key combos yet. Production Gemini, here running Nova Launcher. Just before Christmas, we extensively covered the final pre-production models, along with with many, many photos. At the time, Planet Computing was still working on the keyboard, and right up to the last minute. Some keys were crisp, others mushy. I can say they nailed the consistency issue for the production units. The key travel is almost identical to the Series 5, on which it is so closely modelled. It's good, but for me it lacks the assurance of the Psion Series 5 keyboard. An ideal keyboard provides identical feedback regardless of pressure or angle. The spacebar takes some practice. Gemini doesn't have that consistency, yet, creating a hint of uncertainty in the user's mind. I'd certainly prefer "heavier" keys. Gemini ships with the tool that allows all three metal covers to be removed very easily: the top and bottom plates, and the bracket, or hinge cover. The tool is a metal plate with notches that align with grooves in the device. Off comes the metal and you can see the entire machine. The massive, replaceable 4000 mAh battery sits under the keyboard. The slots for SIM, microSD and camera module are in the the display half. If you ordered one, you'll be able to add the camera module without much fuss. Very soon you'll be able to choose one of four Linux distros (Debian, Sailfish, Ubuntu or Postmarket), once the PC-based Gemini Flashing Tool is released. (See the Planet blog for more details and photos). You'll be able to dual-boot easily. I found a few issues. For example, I gave the machine a passphrase to unlock it, but after a few successful login attempts, I wasn't able to type in the password using the keyboard. There's a workaround when the physical keyboard doesn't work: you can access the onscreen soft keyboard via the emoji key sequence Fn-?. Thank God for that. Another reproducible bug required a remote wipe each time to recover from it. Whatever you do, new users, don't set the popup Planet toolbar to "always on." If you do, the toolbar's menu grabs the focus and can't then be dismissed. At least the Gemini team seems able to get updates out fast. In the first few days, it has already issued a new keyboard driver, available from the Play Store. The Android shipping with this pocket computer is interesting: it has some nice things, and some things that jar. The total absence of support for keyboard shortcuts in popular applications is something that Planet is aware of – and why it's developing a version of the K9 email client that supports key combos. Surprisingly, I found that the Microsoft Word app does respond to shortcuts, but surprisingly again, Android apps designed to support hardware keyboard shortcuts, such as BlackBerry's Hub, didn't respond to those same shortcuts on my Gemini. Perhaps a One True Linux will emerge for the Gemini that supports shortcuts well. It's early days. True to the original Psion design, you find yourself whacking the Escape key as you open the shell. It's a little weird not having volume keys on the side. There are function keys (Fn-C and Fn-V) to adjust volume. I instinctively reached around to the side. Ideally I'd like to see them somewhere. Some people will be annoyed by the lack of a fingerprint reader to unlock the device. I'd take one over a rear-facing camera. That's because the login routine is the standard Android approach: provide a PIN or a passphrase, or (and I don't know anyone who still uses this) draw a pattern. Or no security at all – just a finger swipe. Typing in a passphrase or PIN proves particularly annoying, a constant reminder that this is a version 1.0 product made in a hurry. The swiping to bring up the unlock screen seems completely superfluous, of course, as the assumption should be that if the device is open you don't want a screensaver. You'll find yourself using the Android navigation keys all the time. I sort of forgot the Planet App Bar is there, as you'll use an App Drawer. The launcher is minimal, and doesn't yet start apps via keyboard shortcuts (whereas BlackBerry's Android does.) After a few days, I'd settled into using Nova Launcher as my shell, which works very well. The inclusion of a new built-for-Gemini Notes app is fine, but like Ed Hasbrouck in his excellent overview here, I think the team now needs to focus on where Gemini's value really lies. Which is: a unique writing and thinking tool. You know how your thoughts only emerge coherently after writing them down? You can jot them in your Moleskine or Rymans paper pocketbook, for example. But digitally, you can't set down your thoughts quite the same way into any other comparable device. There's nothing like the Gemini, and that's due to its QWERTY keyboard. Now you just start typing away, streaming ideas onto a digital page, wherever you are, which is a much more pleasant and productive experience than tapping away furiously on a phone or tablet touchscreen. The Gemini is also a full-blown communications tool – but everyone in the world already carries one of those. What the world hasn't got is a digital replacement for the Ryman paper notebook: something for that private space where thoughts take shape. That's where the Gemini comes in. Gemini does modern things, of course: Skype, YouTube, and so on. But these are solutions to problems the world doesn't have. The world doesn't need a pocketable QWERTY clamshell just because there isn't a "pocketable QWERTY clamshell", it needs one because there's great value in such a discrete, portable digital writing tool. Over the page are some screens, and an instant conclusion.